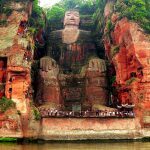 Leshan Giant Buddha is the world’s largest stone statue of Buddha measuring 71 m in height, situated in southern Sichuan province of China, close to the city of Leshan. 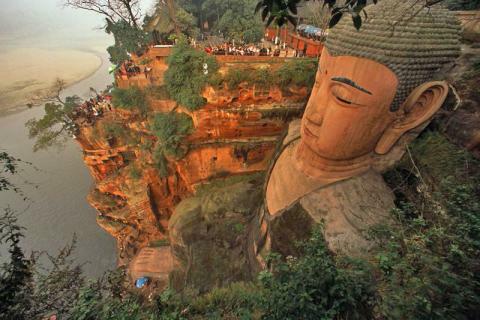 The statue is carved from a hillside, which lies at the meeting point of three rivers namely, Minijang, Dadu, and Qingyi. 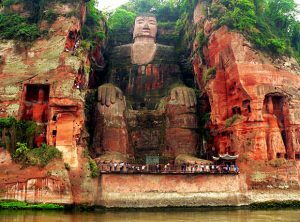 The statue faces Mount Emei with water flowing beneath its feet. 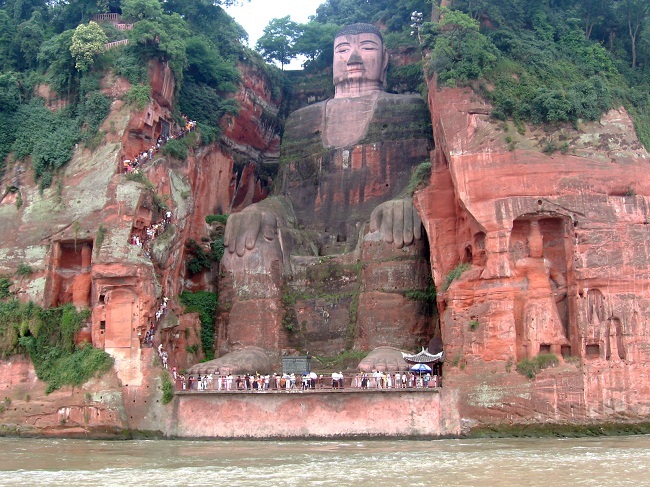 It was erected during the Tang dynasty exemplifying Maitreya. 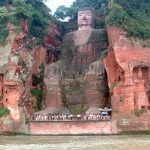 The construction was started by a Chinese cleric named Hai Tong in 713 with a hope that the Buddha would pacify the stormy waters of the river which troubled the shipping vessels. 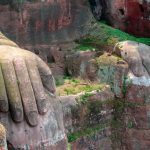 When the government funding was in jeopardy, he made a mark by scooping out his own eyes to show his veneration and dedication. 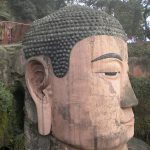 After his demise, the construction was halted for a long time and ultimately the project was funded by a jiedushi, and it was completed by Hai Tong’s disciples in 803. 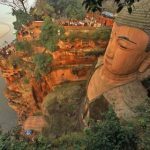 The monk’s idea was not supernatural as such a large amount of rubble poured into the river as a result of the construction that the currents indeed altered and calm down the waters to make safe passages for the shipping vessels. 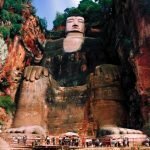 Another interesting artistry is the numerous drainage systems that were laid in the body of the statue to prevent rainwater from clogging, thus safeguarding the statue from erosion and weathering. 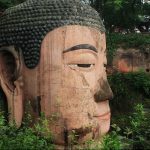 Concurrently, a thirteen story wooden structure was erected to protect it from the rain and sunshine, but it was dismantled by the Mongols during the wars. 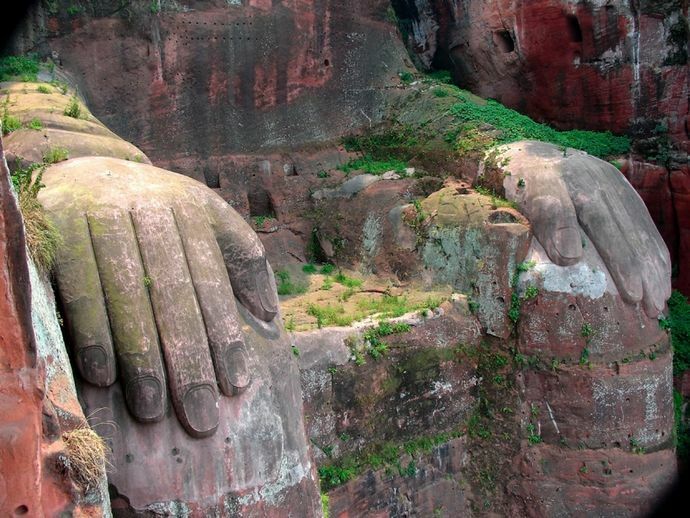 The statue symbolizes a seated Maitreya Buddha with hands resting on the knees. 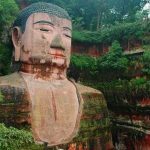 Maitreya is the future Buddha, who would carry on the legacy when Gautama Buddha’s teachings would fade way. 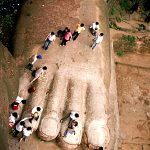 The statue’s shoulders are 28 meters wide whereas the eyebrows are 18 feet long, and its smallest toenail can easily house a seated person. 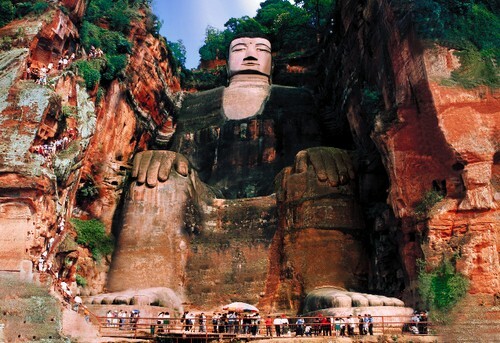 According to a local adage “The mountain is a Buddha, and the Buddha is a mountain”. This is partly due to the shape of the mountain which resembles a sleeping Buddha when viewed from the river. 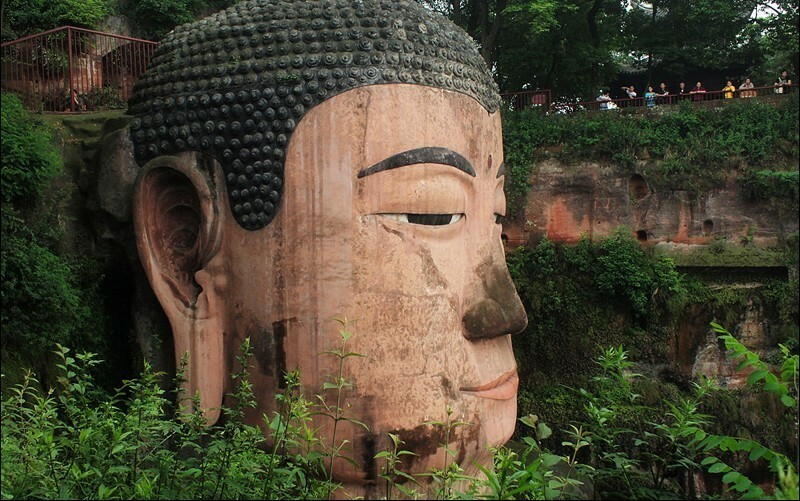 The Buddha’s coiled hair consists of 1021 buns adeptly embedded in the hair. 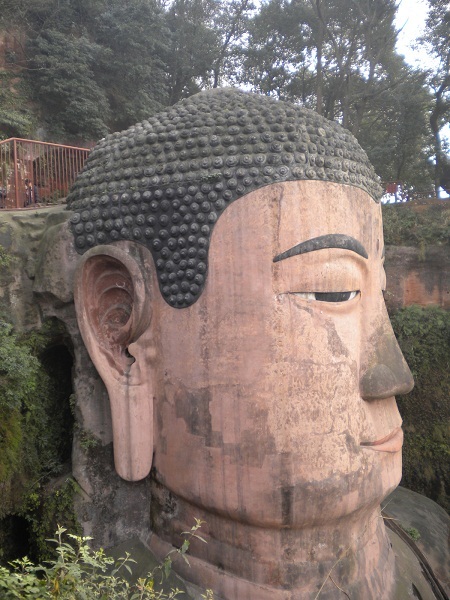 A statue of the monk Hai Tong stands on the terrace which lies next to the ear of the statue. 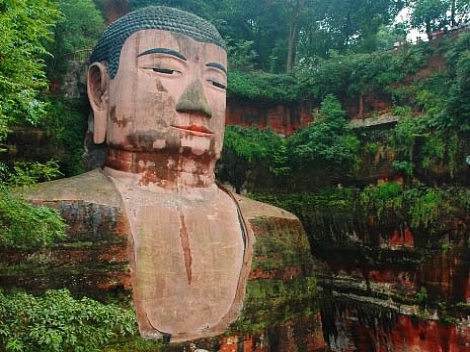 The giant Buddha has been exposed to air pollution, weathering and unrestrained developments in the region. 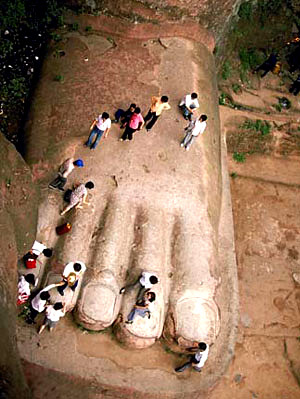 At present, the government has initiated restoration work under the guidelines from UNESCO.